Eyeing opportunities: Crazeal.com chief executive Ankur Warikoo. Hyderabad: The Indian arm of Groupon Inc., the world’s largest daily deal website, will go live in 11 cities with a new brand identity this week and move to the company’s global, more robust technology platform as it seeks a bigger share of the country’s expanding market for discount coupons. SoSasta.com, rebranded as Crazeal.com, will be fully functional in Ahmedabad, Bangalore, Chandigarh, Chennai, Delhi, Hyderabad, Jaipur, Kolkata, Mumbai, Nagpur and Pune. After strengthening its brand in these places, Crazeal plans to expand into more small cities and towns—the so-called tier-2 cities—in an attempt to tap consumers beyond the metros. 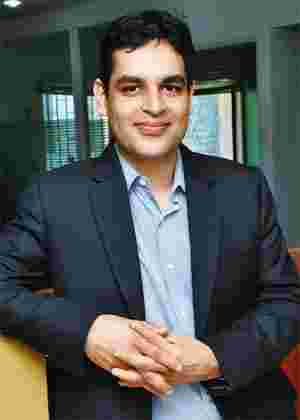 “There is a lot of traction we are seeing from those cities (tier-2), both across products and travel," chief executive Ankur Warikoo said in an interview during a recent visit to his alma mater—the Indian School of Business, Hyderabad. “Small cities will only have about five-six top-rated restaurants or spas. So there is a limited opportunity there, but around products and travel, there is a lot of opportunity and that’s where we want to dive into," Warikoo said. Local services form one of three areas the discounter, which takes a part of the sales that take place on its website, operates in, the other two being product shopping and travel, where customers avail discounts in categories such as electronic goods, home appliances, apparel and tour packages. Crazeal is competing in an Indian coupons market that is already crowded, with at least 20 daily deal websites trying to imitate Groupon’s US model. Some have prospered, such as Snapdeal.com, the largest company in this category with eight million registered members and operations in 50 cities. Snapdeal recently raised $40 million (Rs 195.6 crore) in funding from Bessemer Venture Partners, Nexus Venture Partners and IndoUS Venture Partners, in addition to $12 million it raised in January from Nexus Venture and IndoUS Venture. In a report released in July, Internet research firm comScore said one in 10 Internet users in India had accessed a coupon site in June. Snapdeal, the early mover, had some 1.47 million unique visitors that month, followed by Dealsandyou.com (990,000) and Mydala.com (952,000). At fourth place, with 586,000 unique visitors, was SoSasta.com, which Chicago-based Groupon bought for an undisclosed sum in January. “In the past several months, deal sites have seen their audiences increase significantly as the global online coupon trend has taken root in India," Kedar Gavane, comScore’s director for India, said in a statement accompanying the data. Analysts see the proliferation of daily deal sites as a booster to rev up India’s e-commerce market. “Consumer adoption of these types of deal sites could be an important step in the overall growth of e-commerce in India, which has traditionally lagged behind other global markets," Gavane said. Warikoo said Crazeal will differentiate itself from its competitors in terms of its deal quality and experience, and by offering a product range spanning pens and shoes to bedsheets and beanbags in addition to traditional fare such as restaurant and spa discounts and cut-price mobile phones. “It’s a discovery engine, but a discovery engine that goes beyond Google," he said of Crazeal. “It allows you to buy that discovery. It’s not about search any more. It’s about transaction, but in a way that pricing is the key." In the US, Groupon has filed for an initial public offering of its shares to raise $750 million—touted as one of the hottest stock sales this year. It has had its share of troubles since. Some of Groupon’s accounting metrics have come under the scrutiny of the US Securities and Exchange Commission. In September, Groupon halved its earlier stated revenues to $312.9 million (2010) and $688.1 million (2011 first half), and announced the exit of its second chief operating officer in six months. Groupon had 116 million subscribers as of 30 June, adding 33 million in between April and June. Its India arm had its own issues to confront. Business security portal Risky.biz reported in June that SoSasta’s database was compromised and data including usernames and passwords had been published on the Internet. Warikoo acknowledged the breach, but said no sensitive information had been leaked. To reassure customers, Crazeal is migrating from its local technology platform to Groupon’s more secure global platform, with its layout mimicking the parent website’s design. “The kind of interactions and the ease that we will allow both for the merchants and for the customers are completely what is happening in any other country. That is a big leap for us. We matched that technology movement with the rebranding that is happening right now," Warikoo said. The rebranding exercise has nothing to do with the exit of SoSasta’s founders Ananya Bubna and Udayan Bubna from the company’s board last month, according to Warikoo. The company is also embroiled in a legal battle over the domain name ‘Groupon.in’ with a Bangalore-based firm, ValueNet Ecommerce Pvt. Ltd, which registered the domain name in September 2009. Warikoo declined comment as the matter is in court, but shook his head in the negative when asked if the company was trying for an out-of-court settlement.